With countless different wedding ceremony and reception location options in beautiful Southern California, it’s no wonder couples often have a hard time deciding where they want their “I dos” to take place. To help you narrow your decision to only venues that best suit your party’s needs and you and your fiancé’s unique personalities, we at Hollywood Banquet Hall have identified the pros and cons of some of the most popular types of Los Angeles wedding venues and locations. 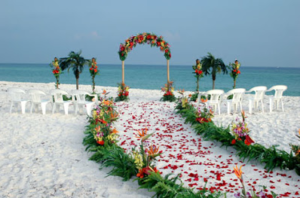 Especially in sunny Southern California, beach weddings are easily accessible, gorgeous, and offer the sound of the ocean as the backdrop for your ceremony. Pros: Besides the aforementioned benefits, beachside weddings are a little less expensive, since most of the décor is already there (i.e., nature). Cons: Couples who want to get married with the sand between their toes shouldn’t be surprised when they need to acquire special permits (varies by city). Be sure to clear this if it’s necessary. You should also consider that there may be rain or lots of wind, and unless you’re on a private beach, there may be random beach-goers who interrupt the ceremony and/or your photos. 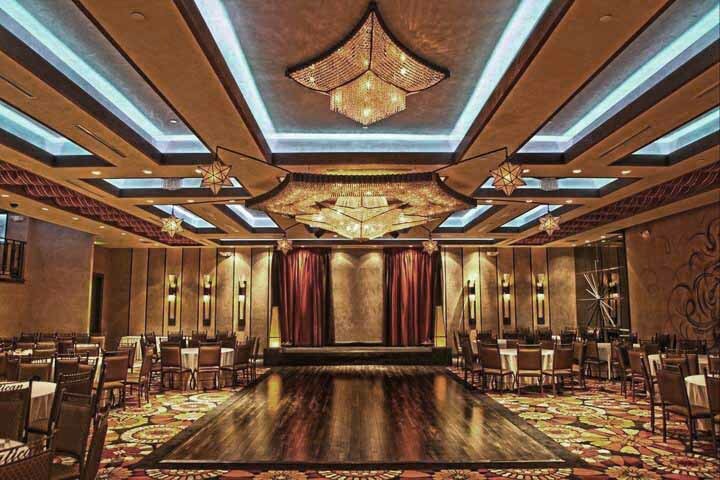 Extremely popular with couples that are looking for an upscale atmosphere and complete service packages, banquet halls offer clients luxury, convenience, and a streamlined experience. Pros: Besides offering a stunning wedding space with a dance floor and band area, many banquet halls also provide event planners, catering services, beautiful bars, valets, and lighting technicians all under one roof and manager—and partnerships with local vendors means that nearly any request can be met. Cons: Some banquet halls can be pricey, and many don’t have outdoor areas for photos. Be sure to ask about these things when visiting, since some banquet halls work with others to provide outdoor photography. Flowers, flowers everywhere! Botanical gardens are a very popular spot for wedding ceremonies. 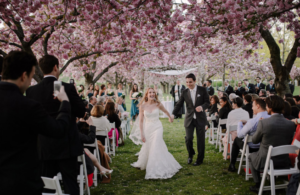 Pros: A wedding photographer’s dream, botanical garden wedding settings offer magnificent surroundings and help cut the cost of buying flowers down to almost nothing. Cons: Because most budgets don’t allow for renting out the entire garden, however, be prepared for the possibilities of awkward gawkers, loud children, and ill-timed sprinklers. Heat and bugs may also be a problem in the summer months, so if you’re truly set on having a botanical garden wedding, try to schedule it for early spring or late fall if possible. 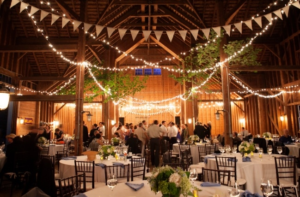 Hosting your wedding or reception in a rustic location, such as an old barn or on a ranch, is still an older trend that’s still very popular with adventurous couples. Pros: This option affords wedding parties a relaxed atmosphere, scenic views, and the opportunity to implement creative decorations like hanging Christmas lights, hand-painted signs on reclaimed wood, and mason jars. Many people love this type of venue, since it offers beautiful photography and a sweet, romantic setting. Cons: Couples who are considering a rustic wedding venue be warned: decorating and clean-up will fall to you, there may not be any air conditioning, electric outlets are scarce in the country, and one rogue rainstorm can seriously ruin your day. 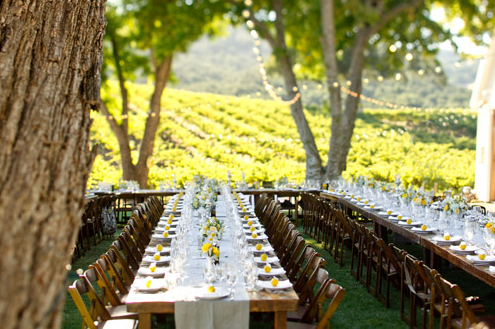 When it comes to Los Angeles wedding venues, nothing says class like hosting your wedding ceremony or reception at a vineyard. Pros: Not only will the scenery be fantastic and the wine excellent, but most vineyards also have tasting rooms that serve as perfect reception spaces. Cons: Drawbacks include high costs and lots of coordination, especially if the vineyard doesn’t have a tasting room and you’ll need to supply the tents, flooring, food, and entertainment yourself. As one of the best Los Angeles wedding venues, Hollywood Banquet Hall hosts many beautiful and unforgettable weddings. If you’re currently planning your own wedding and you’re looking for the perfect Los Angeles wedding venue, please contact us with any questions. We look forward to hearing from you!